Immigrant labor is more vital to many industries than it’s ever been before. Immigrants have always made up most of the country’s farm workers in the West and Southwest. Today, according to the U.S. Department of Labor, about 57% of the country’s entire agricultural workforce is undocumented. But the list of other industries dependent on immigrant labor is long—meatpacking, some construction trades, building services, healthcare, restaurant and retail service, and more. Protest in front of Oakland City Hall against the election of Donald Trump as U.S. President. Credit: All photos © David Bacon (dbacon.igc.org). During the election campaign, candidate Donald Trump pledged in his “100-day action plan to Make America Great Again” to “begin removing the more than two million criminal illegal immigrants from the country” on his first day in office. In speeches, he further promised to eventually force all undocumented people (estimated at 11 million) to leave. In a society with one of the world’s highest rates of incarceration, crimes are often defined very broadly. In the past, for instance, under President George W. Bush federal prosecutors charged workers with felonies for giving a false Social Security number to an employer when being hired. He further proposed the complete enforcement of employer sanctions—the provision of the 1986 Immigration Reform and Control Act that forbids employers from hiring workers without papers. Bush’s order would have had the Immigration and Customs Enforcement agency (ICE) check the immigration status of all workers, and required employers to fire those without legal immigration status, before being blocked by a suit filed by unions and civil rights organizations. Under President Obama, workplace enforcement was further systematized. In just one year, 2012, ICE audited 1600 employers. Tens of thousands of workers were fired during Obama’s eight years in office. Given Trump’s choice of Alabama Senator Jeff Sessions as Attorney General, greater workplace enforcement is extremely likely. Sessions has been one of the strongest advocates in Congress for greater immigration enforcement, and has criticized President Obama for not deporting enough people. Last year he proposed a five-year prison sentence for any undocumented immigrant caught in the country after having been previously deported. Both deportations and workplace firings face a basic obstacle—the immigrant workforce is a source of immense profit to employers. The Pew Hispanic Center estimates that, of the presumed 11 million people in the country without documents, about 8 million are employed (comprising over 5% of all workers). Most earn close to the minimum wage (some far less), and are clustered in low-wage industries. In the Indigenous Farm Worker Survey, for instance, made in 2009, demographer Rick Mines found that a third of California’s 165,000 indigenous agricultural laborers (workers from communities in Mexico speaking languages that pre-date European colonization) made less than minimum wage. The federal minimum wage is still stuck at $7.50/hour, and even California’s minimum of $10/hour only gives full-time workers an annual income of $20,000. Meanwhile, Social Security says the national average wage index for 2015 is just over $48,000. In other words, if employers were paying the undocumented workforce the average U.S. wage it would cost them well over $200 billion annually. That wage differential subsidizes whole industries like agriculture and food processing. If that workforce were withdrawn, as Trump threatens, through deportations or mass firings, employers wouldn’t be able to replace it without raising wages drastically. As president, Donald Trump will have to ensure that the labor needs of employers are met, at a price they want to pay. The corporate appointees in his administration reveal that any populist rhetoric about going against big business was just that—rhetoric. But Hillary Clinton would have faced the same necessity. And in fact, the immigration reform proposals in Congress from both Republicans and Democrats over the past decade shared this understanding—that U.S. immigration policy must satisfy corporate labor demands. During the Congressional debates over immigration reform, the Council on Foreign Relations (CFR) proposed two goals for U.S. immigration policy. In a report from the CFR-sponsored Independent Task Force on U.S. Immigration Policy, Senior Fellow Edward Alden stated, “We should reform the legal immigration system so that it operates more efficiently, responds more accurately to labor market needs, and enhances U.S. competitiveness.” He went on to add, “We should restore the integrity of immigration laws, through an enforcement regime that strongly discourages employers and employees from operating outside that legal system.” The CFR, therefore, coupled an enforcement regime—with deportations and firings—to a labor-supply scheme. 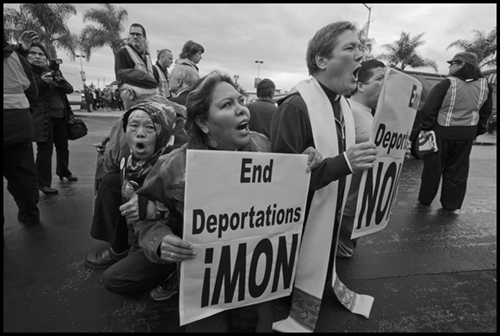 Immigrants, workers, union members, people of faith and community activists demonstrated in Silicon Valley, calling for a moratorium on deportations and the firing of undocumented workers because of their immigration status. This framework assumes the flow of migrating people will continue, and seeks to manage it. This is a safe assumption, because the basic causes of that flow have not changed. Communities in Mexico continue to be displaced by 1) economic reforms that allowed U.S. corporations to flood the country with cheap corn and meat (often selling below the cost of production—known as “dumping”—thanks to U.S. agricultural subsidies and trade agreements like NAFTA), 2) the rapacious development of mining and other extractive concessions in the countryside, and 3) the growing impoverishment of Mexican workers. Violence plays its part, linked to the consequences of displacement, economic desperation, and mass deportations. Continuing U.S. military intervention in Central America and other developing countries will produce further waves of refugees. While candidate Trump railed against NAFTA in order to get votes (as did Barack Obama), he cannot—and, given his ties to business, has no will to—change the basic relationship between the United States and Mexico and Central America, or other developing countries that are the sources of migration. Changing the relationship (with its impact on displacement and migration) is possible in a government committed to radical reform. Bernie Sanders might have done this. Other voices in Congress have advocated it. But Trump will do what the system wants him to do, and certainly will not implement a program of radical reform. The structures for managing the flow of migrants are already in place, and don’t require Congress to pass big immigration reform bills. In Washington State alone, for instance, according to Alex Galarza of the Northwest Justice Project, the Washington Farm Labor Association brought in about 2,000 workers under the H-2A guest worker program in 2006. In 2013, the number rose to 4,000. By 2015, it grew to 11,000. In 2016, it reached 16,000. That kind of growth is taking place in all states with a sizeable agricultural workforce. The H-2A program allows growers to recruit workers outside the country for periods of less than a year, after which they must return to their country of origin. Guest workers who lose their jobs for whatever reason—whether by offending their employer, or not working fast enough, for example—have to leave the country, so joining a union or protesting conditions is extremely risky. Growers can only use the program if they can show they can’t find local workers, but the requirement is often unenforced. The program for foreign contract labor in agriculture is only one of several like it for other industries. One study, “Visas, Inc.,” by Global Workers Justice, found that over 900,000 workers were brought to the United States to work every year under similar conditions. The number is growing. In the context of the growth of these programs, immigration enforcement fulfills an important function. It heralds a return to the bracero era, named for the U.S. “guest worker” program that brought millions of Mexican farmworkers to the United States between 1942 and 1964. The program was notorious for its abuse of the braceros, and for pitting them against workers already in the United States in labor competition and labor conflict. In 1954 alone, the United States deported over a million people—while importing 450,000 contract workers. Historically, immigration enforcement has been tied to the growth of contract labor, or “guest worker” programs. Arresting people at the border, firing them from their jobs for not having papers, and sending people to detention centers for deportation, all push the flow of migrants into labor schemes managed to benefit corporations. The more a Trump administration pushes for deportations and internal enforcement, the more it will rely on expanding guest worker programs. The areas where programs like H-2A are already growing were heavy Trump supporters. In eastern Washington, a heavily Trump area, immigration agents forced the huge Gebbers apple ranch to fire hundreds of undocumented workers in 2009, and then helped the employer apply for H-2A workers. While the undocumented workers of eastern Washington had good reason to fear Trump’s threats, employers knew they didn’t have to fear the loss of a low-wage workforce. Deportations and workplace enforcement will have a big impact on unions and organizing rights. Immigrant workers have been the backbone of some of the most successful labor organizing of the last two decades, from Los Angeles janitors to Las Vegas hotel workers to Republic Windows and Doors in Chicago. At the same time, the use of the E-Verify database under President Obama often targeted workers active in labor campaigns like Fight for $15, as did earlier Bush and Clinton enforcement efforts. Unions and immigrant communities have developed sophisticated tactics for resisting these attacks, and will have to use them effectively under Trump. Janitors in Minneapolis fought the firing of undocumented fast-food workers in Chipotle restaurants. The International Longshore and Warehouse Union (ILWU) teamed up with faith-based activists, immigrant-rights groups, and environmentalists to stop firings of undocumented workers in Bay Area recycling facilities, winning union representation and higher wages as a result. The same unions and community organizations that have fought enforcement in the workplace have also fought detentions and deportations. Immigrant Latino workers from the Woodfin Suites hotel in Emeryville, Calif., and their supporters protest after hotel managers fired 20 workers, accusing them of lacking legal immigration status. These efforts will have to depend on more than a legal defense. The Supreme Court has already held that undocumented workers fired for organizing at work can’t be rehired, and their employers don’t have to pay them back pay. Trump’s threatened enforcement wave extends far beyond the workplace. He promised increased enforcement on the U.S.-Mexico border, expanding the border wall, and increasing the number of Border Patrol agents beyond the current 25,000. Immigration enforcement already costs the government more than all other federal law enforcement programs put together. Trump proposed an End Illegal Immigration Act, imposing a two-year prison sentence on anyone who re-enters the U.S. after having been deported, and five years for anyone deported more than once. Under President Obama, the United States deported more than two million people. Hundreds of thousands, with children and families in the United States, have tried to return to them. Under this proposed law, they would fill the prisons. One of Trump’s “first day” commitments is to “cancel every unconstitutional executive action, memorandum and order issued by President Obama.” This promise includes Obama’s executive order giving limited, temporary legal status to undocumented youth brought to the United States by their parents (Deferred Action for Childhood Arrivals, or DACA). DACA has been attacked by the right-wing ideologues advising Trump’s transition team since Obama issued his order. 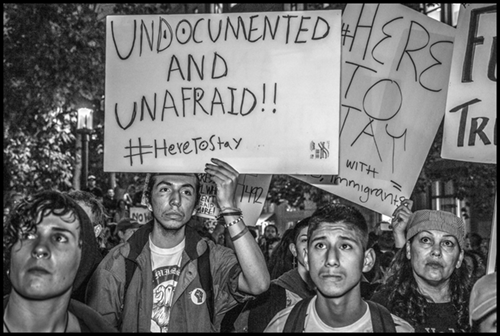 The 750,000 young people who gained status under DACA—the “Dreamers”—have been one of the most active sections of the U.S. immigrant-rights movement. But they had to give the government their address and contact information in order to obtain a deferment, making them vulnerable to deportation sweeps. Defending them will likely be one of the first battles of the Trump era. Trump further announced that on his first day in office he will “cancel all federal funding to Sanctuary Cities.” More than 300 cities in the United States have adopted policies saying that they will not arrest and prosecute people solely for being undocumented. Many cities, and even some states, have withdrawn from federal schemes, notably the infamous “287(g) program,” requiring police to arrest and detain people because of their immigration status. Trump’s proposed order would cancel federal funding for housing, medical care, and other social services to cities that won’t cooperate. As attorney general, Sessions can be expected to try to enforce this demand. After the election, many city governments and elected officials were quick to announce that they would not be intimidated. The Dreamers especially see direct action in the streets as an important part of defending communities. In the push for DACA, youth demonstrations around the country sought to stop deportations by sitting in front of buses carrying prisoners to detention centers. Dreamers defended young people detained for deportation, and even occupied Obama’s Chicago office during his 2012 re-election campaign. In detention centers themselves, detainees have organized hunger strikes with the support of activists camping in front of the gates. Maru Mora Villapando, one of the organizers of the hunger strikes and protests at the detention center in Tacoma, Wash., says organizers cannot just wait for Trump to begin his attacks, but have to start building up defense efforts immediately. She advocates pressuring the Obama administration to undo as much of the detention and deportation machinery as possible before leaving office. “We don’t want him just to hand over the keys to this machine as it is right now,” she warns. To defeat the Trump enforcement wave, immigrant activists in unions and communities will have to fight for deeper understanding and greater unity between immigrants and U.S.-born people. Workers in general need to see that people in Mexico got hit by NAFTA even harder than people in the U.S. Midwest—and their displacement and migration isn’t likely to end soon. In a diverse workforce, the unity needed to defend a union or simply win better conditions depends on fighting for a country and workplace where everyone has equal rights. 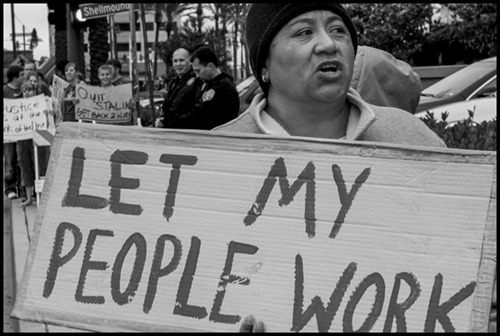 For immigrant workers, the most basic right is simply the right to stay. Defending that right means not looking the other way when a coworker, a neighbor or a friend is threatened with firing, deportation, or worse. The rise of a Trump enforcement wave spells the death of the liberal centrism that proposed trading increased enforcement and labor supply programs for a limited legalization of undocumented people. Under Trump, the illusion that there is some kind of “fair” enforcement of employer sanctions and “smart border enforcement” will be stripped away. Sessions will have no interest in “humane detention,” with codes of conduct for the private corporations running detention centers. The idea of guest worker programs that don’t exploit immigrants or set them against workers already in the United States will face the reality of an administration bent on giving employers what they want. DAVID BACON is a journalist and photographer covering labor, immigration, and the impact of the global economy on workers. He is author of several books, including Illegal People: How Globalization Creates Migration and Criminalizes Immigrants (Beacon Press, 2009). SOURCES: “Donald Trump’s Contract with the American Voter” (donaldjtrump.com); Chico Harlan, “The private prison industry was crashing—until Donald Trump’s victory,” Wonkblog, Washington Post, Nov. 10, 2016 (washingtonpost.com); U.S. Immigration and Customs Envorcement, “Delegation of Immigration Authority Section 287(g) Immigration and Nationality Act” (ice.gov); Interfaith Movement for Human Integrity (im4humanintegrity.org); Community Initiatives for Visiting Immigrants in Confinement, “End the Quota” (endisolation.org); Jens Manuel Krogstad, Jeffrey S. Passel, and D’Vera Cohn, “Five facts about illegal immigration in the U.S.,” Pew Research Center, Nov. 3, 2016 (pewresearch.org); Bureau of Labor Statistics, “Foreign-Born Workers: Labor Force Characteristics, 2016,” May 19, 2016 (bls.gov); Jie Zong and Jeanne Batalova, “Frequently Requested Statistics on Immigrants and Immigration in the United States,” Migration Information Service, April 14, 2016 (migrationpolicy.org); “Selected Statistics on Farmworkers,” Farmworker Justice, 2014 (farmworkerjustice.org); “Indigenous Mexicans in California Agriculture,” Indigenous Farmworker Study (indigenousfarmworkers.org); “U.S. Immigration Policy Task Force Report,” Council on Foreign Relations, August 2009 (cfr.org); “Visas, Inc.: Corporate Control and Policy Incoherence in the U.S. Temporary Foreign Labor System,” Global Workers Justice Alliance, May 31, 2012 (globalworkers.org); “H-2A Temporary Agricultural Workers,” U.S. Citizenship and Immigration Services (uscis.gov); Buzz Malone, “Stop Blaming Immigrants and Start Punishing the Employers Who Exploit Them,” Working In These Times (blog), Nov. 15, 2016 (inthesetimes.com); David Bacon, Illegal People (Beacon Press, 2008); David Bacon, The Right to Stay Home (Beacon Press, 2013); David Bacon, author interviews with Alex Galarza, Maru Mora Villapando, Deborah Lee, and Sergio Sosa (2016); Mae M. Ngai, Impossible Subjects: Illegal Aliens and the Making of Modern America (Princeton University Press, 2004); Ronald L. Mize and Alicia C. Swords, Consuming Mexican Labor: From the Bracero Program to NAFTA (University of Toronto Press, 2010).